I want to give a big thanks to Terra for guest posting last Tuesday, and sharing her adorable baby dress. It is lovely, and it sure looks like a lot of fun to dress up those little girls. Dressing up a boy can be quite fun as well, you just have to work with what you have. So today we are going to try to get away from footed newborn pajamas, and get our newest bundles of joy ready for the holidays. I love baby booties (I know you know that). My Sister in law, who is expecting her third little boy, recently made a request for some cute baby boy booties. This is my first attempt at baby boy booties, I decided to make a wing tip version for the little guys (see the little girl version here). I added the second layer of faux leather, and punched holes in varying sizes around the shoe. My husband informed me that he thinks that they are borderline girly, but I would say borderline unisex. Now that baby has a new pair of shoes, let's work on the rest. When Clark was a little guy I loved having him in pants. We had a pair of navy blue cords that he wore for quite a while. 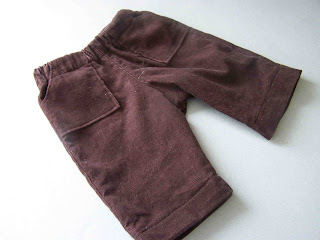 I wanted me nephews to have some comfortable and stylish pants to sport this holiday season. 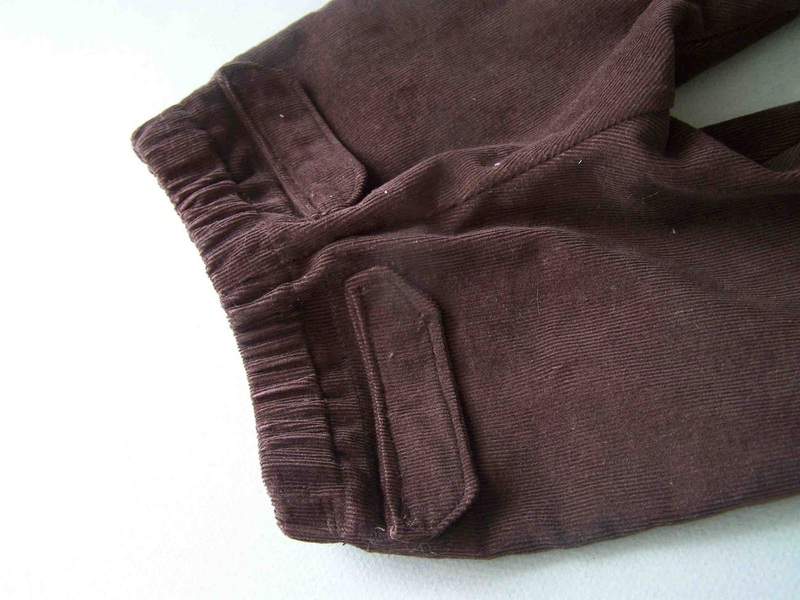 I pulled out a pair of Clark's newborn pants, and made a pattern for this pair. 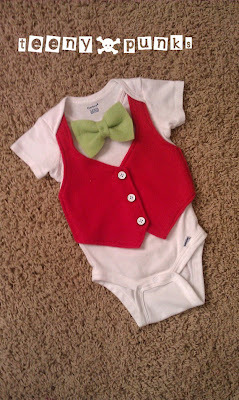 To complete the holiday look, why not add a cute appliqued necktie onesie. I'm sure that you've seen them around, but they sure are cute. Char from Crap I've Made, has an easy to follow tutorial here. I've been meaning to make one of these for my sister's little guy, but I haven't found the time. If you can't find the time now either, perhaps you'd be interested in one of the many versions for sale on etsy. I am quite fond of this holiday bow tie number from Teeny Punks. I hope that this inspires you to dress up those baby boys. For more Holiday Apparel inspiration check out the Hip for the Holidays link party. Thanks for reading. I'll be linking up here. those shoes are the cutest little things!!! did you use a pattern or make your own? My little guy is 6 months old and I would love some mini-loafers for him but am balking at spending $20 for something that will only last 3 months. Adorable!! 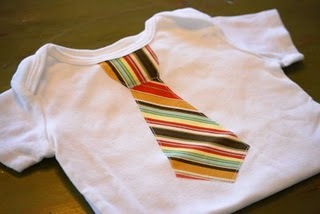 :) I've never sewn for boys... mostly because we only have girls in our family! lol. :) Those shoes are adorable! Awesome outfit. I think those shoes look very boy like. The shoes are definitely FABULOUS. I love that you write that you basically just whipped up a pattern. Maybe someday I'll have that talent! Thanks for linking up! super darling! Love the boy ideas! 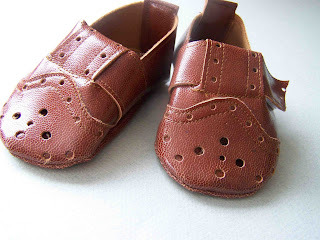 Hey Tricia, just FEATURED your little booties today, so CUTE, I have got to start trying some of these things out. You just make everything look so simple. :) So come grab a button, if you don't already have one, he he. Thanks for always supporting me in my parties, and can't wait to see what you do next. PS- The bowtie tux comes in several different colors and patterns. Happy New Year!